Fresh products (crabs, Boston lobster, treasure crab, king crab and other crustacean fresh aquatic). All kinds of fresh aquatic products become daily consumer goods, going to the dinner tables through the e- business channel. The biggest problem encountered by e-commerce dealers in the development of fresh goods market is the lack of facilities for temporary storage, fresh aquatic transport resources, and the difficulty in controlling fresh aquatic death rate in hot weather. JIUYE Supply Chain integrates storage resources of temporary pools in different areas, and then provides third-party temporary warehouses for small and medium-sized electric business operators. 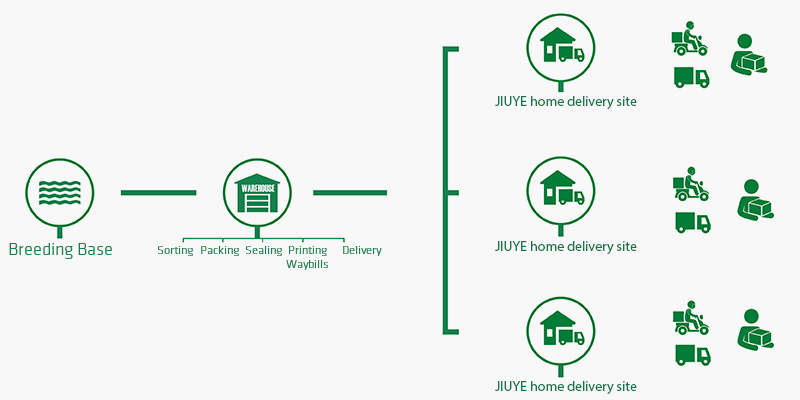 Equipped with professional packaging services, JIUYE ensures such services, through rapid sorting, packing, transit, distribution and claims, the time efficiency and quality of such special delivery. Even for the crabs and other agricultural products of regional characteristics, JIUYE sets up local delivery points to ensure loss minimization of fresh water products in the transport process, as well as provide the trace ability information nodes of the origin. The aquaculture base completes the sorting, packing, packaging, stickers and others, then fulfills direct regional distribution. If it needs distribution nationwide, JIUYE will increase additional regional cargo holding pools according to the order density and the actual situation, and then distributes by the way of aviation plus cold chain.